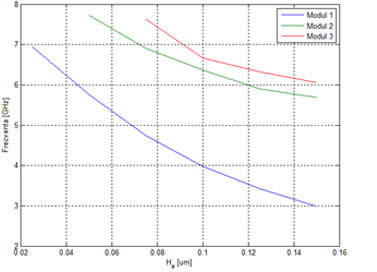 In the third stage of the project were identified the optimized parameters (i.e., base pressure: ~4 x 10-5 Pa, total working pressure 0.2 Pa, partial nitrogen pressure 0.05 Pa) for the fabrication of a thin AlN film, with thickness of ~1 μm, having a full width half-maximum of the 002 rocking curve lower than 4° (Fig. 1a). The morphological, structural, compositional and mechanical characteristics of this type of layer were investigated using a plethora of advanced analysis techniques (SEM, AFM, TEM, XRD, SAED, EDS, XPS, pull-out tests, nano-indentation assays, nano-scratch tests, and nano-wear measurements). The XPS analysis revealed a concentration of Al-O-N bonds of ~5% (which indicates the low oxygen contamination of the AlN film) (Fig. 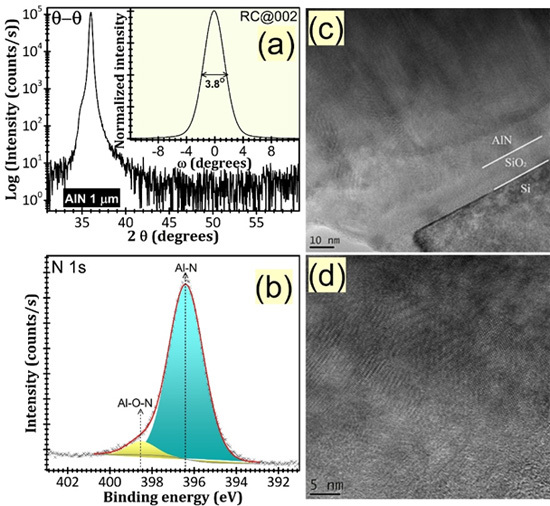 1b), whilst the TEM investigations evidenced the compact and uniform morphology of the optimized AlN film (Fig. 1c,d). This type of AlN film elicits an excellent bonding strength to the Si substrate (~47.6±2.6), and possesses an elastic modulus close to bulk AlN values (342.3±16.9 GPa), hardness higher than the bulk AlN (26.4±0.8 GPa), and very good resistance to scratch and wear tests (wear rate at 6 mN: 8.6*10-7 mm3/Nm). Figure 1: (a) Typical XRD diagram recorded in θ–θ symmetric geometry and the corresponding 002 rocking curve of the optimized AlN thin film. (b) N 1s core level XPS spectrum of the AlN film. Symbols represents the experimental data, the curves indicate the overall fit and identified components. (c,d) Cross-sectional TEM images of AlN thin film: general morphology (c); high-resolution micrograph (d). 2) the thermal expansion both by means of the strains that depend on the coefficient of the thermal expansion and the considering of a prestress in the model, due to the initial thermal expansion (Fig. 1) that induces mechanical stress in the model due do different expansion coefficients of the substrate and the piezoelectric. The numerical results show that indeed, the increase of the temperature leads to a frequency shift with sensitivity of the order of hundreds of kHz/degrees C and a TCF of tens of ppm/degrees C.
For the technological manufacturing of demostrator II, new masks have been designed and a new technological run using thin optimised AlN on high resistivity (111) silicon has been performed. The first technological step was the definition of the IDTnano structures contacts, with a lift-off process. The Ti/Au metallisation width was 220 nm (20 nm/200nm). For the IDTs a lithographic process with electron beam equipement has been used, the length/distance between digits/interdigits obtained was 170nm si 200nm. The IDTs metalisation is 55nm (5 nmTi/50 nm Au). The masks for demonstrator II have two configurations of interdigitated traductors: the distance digit/interdigit of 200 nm and 170 nm. All IDTs have 150 digits with 50 µm length. IMT-CO together with RQ-P3: Microphisycal characterization and temperature dependence of the optimized temperature sensors based on SAW resonators. The sensors structures have been designed for resonance frequencies over 5 GHz. This frequecy domaine have imposed 200nm si 170nm dimensions of IDTs, obtained by nanolitography. 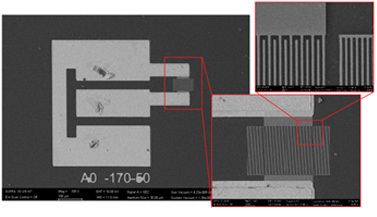 The microwave characterisation have been performed with a VNA - Vector Network Analyzer) 37397D from Anritsu, together with direct measurements on wafer with probes Suss Microtec PM5 system. S11 parameter measurements have been used in order to obtain sensor temperature data by SAW structure resonance frequency variation. The temperature dependence has used the SHI-4H-1 de la firma Janis Research Company cryostat with 5 K up to 500 K temperature range . Resonance frequency dependence with temperature measurements have been developed in the -260ºC si 150ºC range. The SAW structures sensibility has been calculated. The values for temperature coeficient of frequency TCF=S obtained are TCF = S = 75 ppm/ºC (s=370kHz/ºC) for structures having digit/interdigit distance of 200nm (fig 6.5 b) and TCF = S = 82 ppm/ºC (s=449 kHz/ºC) for structures having digit/interdigit distance of 170nm (fig 6.6 b).